Set up your Macap M4D or M7D espresso grinder. 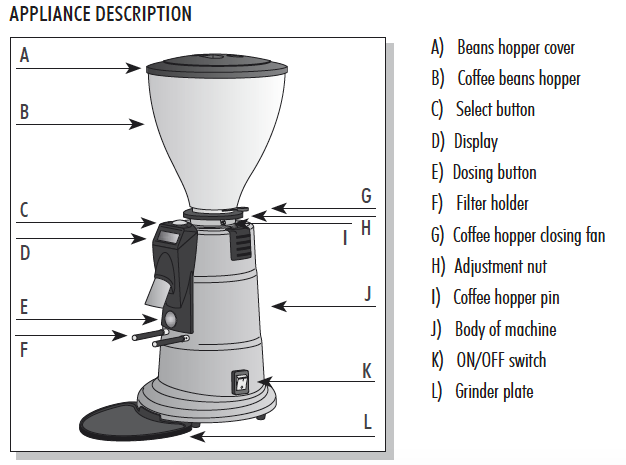 In this user manual, you should find everything you to need to operate and maintain your burr espresso grinder. Please read carefully before using your Macap M7D or M4D espresso grinder. Grind adjustment on the M7D is accomplished using the the worm gear (H) located behind the grinder's hopper. Lower numbers indicate a finer grind and higher numbers indicate a coarser grind. This grinder is infinitely adjustable, so keep in mind that the numbers are simply a reference point. The Macap M7D has 3 programmable timed dose settings. To alter these, press and hold the silver button above the display (C) until the "PROG." menu appears. Spinning the button allows you to choose between the 3 settings and pressing the button will allow you to edit that setting. After selecting one, spin the button to increase or decrease the timed setting. To save and exit press the button once more, then spin the button counter-clockwise until you reach "EXIT", then press again.